On Thursday of the tenth week, we had a final speech as an ending to the class. It was great to see how everything we have talked about in class has been integrated in society not just now, but in the past as well. Seeing how Michael Century broke down the time periods into waves gave me a huge shock that art, science and technology are more entwined than I had come to accept. The time periods he talked about were the Middle Ages, the Renaissance, and Modern times. To each of these he gave a brief description to what they represent. For Middle Ages he gave the word compartmentalization and its description included “little contact between theory and practice”. The Renaissancewas described as a time for hybrids systems, social fluidity and “close interaction between theory and practice, human contact between artist and scientist”. To this description he gave the word decompartmentalization. Lastly, for Modern times Mr. Century gave the word recompartmentalization and described it as a time for dualism and specialization. To further add to his analysis of time periods he enclosed the Middle Ages and the Modern times into boxes to represent stability while the Renaissance period was enclosed in a jaggedshaped object to represent the mixing and coming together of two &quot;distinct&quot; ideas, He, Michael Century, called the threshold. He gave examples of what people in the time of the threshold would do. For example they would have interdisciplinary meeting places, where people like engineers, instrument makers and artist would meet and talk and share their points of view. These groups of mixed field practitioners would often be associated with the term &quot;hunting in packs&quot;, because they had a variety of people who wished to join their fields together and have the rest of the people see them and get to know their idea to undue or lessen the division between the fields. Towards the end Michael Century went on to describe the times we live in today and gave a jagged frame to enclose today’s present time. He said we are in another threshold named the information age and that we are unsure what comes next. He hypothesized that the next stability period might be the political age… To end his marvelous speech he showed various works in which included John Whitney and Oscar Schlemmer. The final thing I wrote down into my notes was a question Mr. Century introduced to us. &quot;What will happen when Bio-tech tools become accessible to the public?&quot; A question discussed by Freeman Dyson in his literary piece titled &quot; Our Biotech Future&quot;. This question made me think of a dark future, but maybe its just because I’m not to positive when it comes ot Biotechnology. After being exposed to the sciences behind natural radio I was quite curious to see what other innovations in sound technology are being used to build a stronger relationship between the power couple, art and science. I was greeted by a presentation by Veit Erimann, the author of Reasoning In Resonance. I was intrigued from the start of his presentation, as he discussed his work as an ethnographer which took him to three different continents in order to ensure that he had a full understanding of the science behind cultures that varied from his own. My interest grew as I realized the amount of controversy his works and ideas has brewed up among scientists. Much of Erimann’s focus is on the “common space” that thinking (reason) and hearing (resonance, as defined by scientists) share, which he cleverly and affectionately refers to as a “re(a)sonance.” This goes directly against the thoughts many scientists have that hearing in the form of resonance is not directly linked to reasoning, but is more explicitly the function of the human ear. I found it fascinating that this idea is so widely held in the scientific community, as I previously thought it to be an indisputable fact that our brains actively work to process all the noises that enter through our ears. To hear Erimann’s account of these widely-shared views would make one think that it is a scientific fact that sounds merely enter the ear canal in order to float around aimlessly in the mind afterwards. Although Erimann’s lecture makes it apparent that not everyone in the public eye views the role of resonance in our everyday lives in the same way that he does, he does cite many ways in which resonance is involved in major aspects of our world. 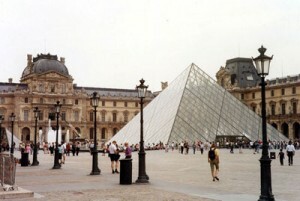 I found it surprising that he cited Claude Perrault, who is best known as the architect of the eastern edge of the Louvre, in his presentation of his ideas. While many who are familiar with Perrault’s name are aware of his architectural contributions to the historic world, many, like myself, were unaware of the lengths to which he went in order to contribute to acoustics. His work as a physicist further highlights the significance that Erimann’s idea of resonance holds in both the arts and the sciences. He could claim to accomplishments in physics and anatomy, as well as successful publications on both subjects. An artist who dabbled in area of sound and truly wanted to ensure that the public was knowledgeable about the subjects of sound media, sources of sound, and sound receivers, shows a very progressive attitude. A depiction of Perrault’s works. This presentation contained a great amount of detail, as Erimann was quite passionate about his work and seemed determined to convey the message that reasoning and resonance are coupled throughout all aspects of life. He even delved into the topic of animist conception and animal spirits, with a focus on the fact that they possess the same qualities as humans when it comes to addressing and processing the sounds that they encounter. The idea of an animist conception was quite unfamiliar to me, but a visit to this website provided an insightful and detailed explanation: http://www.1902encyclopedia.com/A/ANI/animism.html. The overarching message I took away from this presentation tied into that of our class, in the sense that Erimann wanted people to just alter their viewpoints slightly in order to appreciate the connectivity between these two seemingly independent aspects of life. Unsurprisingly, as soon as I entered the Sound and Science Symposium I was shown how it would immediately dive into the connectivity of the arts and sciences. My experience began with Alvin Lucier’s presentation on radio and the way it can be used as a form of art. The project is called Reinventing Radio, and it delves into the concept of natural radio, “radio as environment.” The concept of natural radio was completely novel to me, and I went into the topic with no prior information on the topic. I was able to learn some of the basics of natural radio, which is generated from signals of natural origin in the very low frequency spectrum ranging from 400 to 10,000 Hz. The signals are often generated from solar wind dynamics, but sferics generated by lightning are far more common. Their scope is global, and they serve a functional purpose in navigation and communications systems. The question of this new concept goes beyond the functional, however. It delves into the deeper question of whether listening to natural radio provides a different perspective on nature. I suppose the only way to formulate a true opinion on this is to listen to natural radio for oneself, which can be done by visiting this website: http://www.ab9il.net/vlf/vlf1.html. This only provides a short introductory clip of natural radio, but it also has links to frequencies around the world, which makes the scope of this even more fantastic and limitless. I would say that upon visiting this website my concept of nature was altered, mostly because it gave me the opportunity to listen to aspects of nature that I never previously imagined. Nature, when represented through sound, is usually idealized and limited to the sounds that are familiar to us through everyday exposure. As a result, I expected to hear something reminiscent of a forest, such as a flowing river, rustling leaves, and chirping birds. The fact that I was greeted with more unconventional sounds instead of the familiar was quite refreshing. According to the accounts of frequent natural radio listeners, the sounds are most moving when they coincide with sunrise and sunset, or any time when storms are brewing. I still find it fascinating that there is a way to appreciate these natural phenomena without direct observation, but rather through a series of sounds that leads to unique visualization. This experience is now among the ranks of the other supplements to Art, Science and Technology that I have received during this quarter. Alvin Lucier talked about how natural radio shows the fluidity between theorists, scientists, artists, and activists. After learning the true meaning behind the term and actually experiencing it I can understand the way in which this happens. No one could argue that nature is directly related to both science in the form of classification and observation, or that it is a great influence of many pieces of artwork. However, works involving nature rarely meld the two together in the way that natural radio does, delving into the science of natural wavelengths as a way to provide a pleasurable auditory experience for nature lovers. Another lecture from the Science and Art Symposium I attended was Using Audio Cues to Enhance Navigation and Spatial Learning for the Blind by James Marston. I thought this was very interesting science it was technologically oriented. Also, I personally believe being blind is the worst amongst the three major senses someone can lose: sight, hearing, and speech. Marston brought up many statistics related to blind people, some of the more shocking ones are that 30% of blind people don’t leave home and 70% of them are unemployed. He was very interested in cognitive maps, specifically related to a common environment with landmarks and routes. 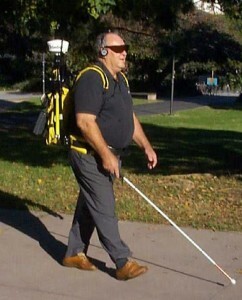 A blind person can cross a path they have previously been to before and never know it, thus being unable to produce a mental map of there surroundings. To help the blind get a sense of their surroundings, Marston discussed UCSB’s Personal Guidance System (PGS). This system requires a spatial database to be compiled, as well as headphones and a GPS unit. This virtual sound method will project objects by name in the direction where it is. For example, if there is a bus stop to your right, you will hear the work bus stop to your right. To me it seems like it would drive someone crazy to hear every object around them, but I believe a future system will have customizable options. A great example of a virtual sound is the following link, this doesn’t apply to helping blind people, but it shows the concept very well; be sure to use headphones. Marston has also explored other similar methods such as having a sound bee when you are walking in the right direction. He conducted many experiments with this concept. He took a few volunteers and setup a complicated path through a city and out in a field. By following the beeps, they were able to complete the course without a problem. Many of the users said that they would be more willing to go out if this system was in place. However there are many issued for a commercial system. The system heavily relies on GPS; however GPS resolution is a big problem. Currently, the civilian GPS has an accuracy of around 3 meters. For sighted people, this is fine since it will get you close enough. However, for a blind person, 3 meters can be the difference between the sidewalk and the middle of the road. Also the cost and time to setup a fully define spatial database is very large. This is a very ambitious project but I think it will be a long time before the public will see real use out of it. First off, I’d like to say how much I really loved Michael Century. Just his presence. I think I might have been the classy frames and timeless voice accented by his adorable frame. His ensemble alone I feel like was a nice intro to what he talked about. This may be a stretch but at the end of the talk, it was evident to me. When he broke his talk down into the 3 interdisciplinarity modes of compartmenalization + decompartmentalization and stability, I saw what he was talking about. Though I felt like it was really obvious at first, I have never thought about it in that way when I learned about the middle ages and the the renaissanece in high school. But once he layed it out in that way, I began to wonder about our mode- the one that we are in currently. He described the information age as being a threshold, which I really loved. It’s so simple yet clear. The threshold being all this knowledge but where to apply it to, more importantly where substantially or effectively apply it to, is what will land us into the new ‘mode.’ He made me think about which direction we’ll be getting and what this will mean for the following generations. I feel like it is still way to early to tell. Maybe it is this ambiguity that puts our generation into the compartmenalization mode. People just having the technology sector of the community in a box that no one but scientists is allowed to open. By doing this, by having the rest of the community just allowing a select few having access to tamper with technology. I really feel like people now are just being contented with the products that continually being accessable to them every holiday season. Things like notebooks and ipods being a few of these said products. I could see this compartmentalization. If people were more active as a community with what technological advances could do to whole communites that extend beyond their own.. that would be something like a revolution, as opposed to sitting dormantly on facebook with your new mac book pro. In the renaissance, Michael talked briefly about the ‘revolution’ that occured between scientists and artists running around as packs. I loved this imagery and somewhat wished I lived in that time. I also liked how he later talked about scientists doing what artists wanted to do. I think I liked this even more. Maybe because now I see how much more people admire/take more seriously, someone who is a science major as opposed to an art major. It’s like the tables have turned and now more emphasis is given to technological sciences, or sciences in general. I feel like, in general people are encouraged to do something like Pre-med as opposed to art history for example and I do acknowledge that that primarily has to do with the certain economic advantages that comes with the medical field. It is something that was challenged in the renaissance period and when this ‘decompartmentalization’ came about. If there is this comparmentalization mode, then I am curious as to what will be the new decomparmentalization. Or maybe this information age has shifted everything and michael’s idea of the 3 modes will render invalid. After attending the lecture “When Sounds Collide,” I felt as if a whole new chapter to human development had been in the making. Peter Narins, from UCLA conducted a very effective presentation about frogs, and their ability to hear with such precision. However, the main thing I was able to do through the presentation was relate what I had learned from Desma to the lecture. What immediately struck me was the fact that we are able to connect nature to science, to help develop human technology. Pertaining to the title, this presentation really tied two cultures, as Peter spoke about “Environmental Influences on the Evolution of Acoustic Communication.” The presentation’s main focus was on how the communications of frogs help scientist develop new ways for human hearing and communication. This presentation tide two cultures in away by showing how nature, in some cases can be considered art, influences technology. Frogs have been witnessed to communicate through ultra sound, and have also found ways to block out surrounding noise that may cause interference. This discovery influenced new approaches to developing hearing aids. The lecture by Peter Narins was pretty interesting, the lecture in a way recapped on the lecture we had on two cultures the first week of school. Art and Technology when combined, create inventions that benefit society in many ways. The world we live in today is full of wild life that influences humans daily on new inventions. For example, our very on security system I learned in an extra credit lecture that different animal panic calls have influenced our alert systems. Subsequently, the use of precision hearing from frogs will be able to benefit society, specifically those who are in need of hearing aids per say. So if we think about it, we can find aspects of nature even in man made technology because nature imposes a heavy influence oh how we produce, and create new material. So the question: is technology natural, may seem hard to answer because technology is influenced by so many sources. Now that I think about it, medicine can be considered a combination of art and science combined to help create a substance used to heel the body. The lecture involved a lot of information, but the information spoke on the subject so it’s not much to blog about because I basically summed it all up in the introduction paragraph. But to close it out, Art and science collaboration has created a more stable and amusing life. Things seem more appealing and things seem to catch the eye more. Since this is my last blog, I wanted to share how I view the art and science majors at UCLA. Personal there seem to be a division between the two, and while taking this GE I have found the art majors more creative with their projects and also how they view society. They seem to think more so out side the box, where as just following formulas and theorems all the time. I attended Michael Century lecture on last day of desma9 class and it was very interesting and great closing lecture.The technology rebellion is speeding up and is more troublesome to the economy than the last. Data are now converging, low cost bandwidth is more and more reachable and information knowledge is at this time accessible to everyone.Inter-individual and inter-organisational connectivity and knowledge switch over has augmented spectacularly, enabled by the extensive adoption of manufacturing models and the speedy go down in the price of organization incorporation. System of governments are realising the influence of the end-to-end relationship from desktop to data centre and are making ways to be more bendable and price efficient. For example, tools now have multiple positions and consumers have multiple devices, making difficulty and under-utilization. The advent of compute in the network simplifies administration, reduces operational price and permits customers to contribute to facilities and advantage from an enhanced deal. Over past few decades, of computing power and tiny – process quicker, accumulate better, create it with fewer prices, and make it slighter. We are living in a new era 21’s century- the age of the digital systemic financial system, in place harness the capability to calculate and the capability to make relation creates chances and many good and new methods of functioning that have long been talked about, but up till now, were not possible. Let’s think about the growth of web services and the new industry divisions that have been made on the power of this technology appearance. Data aggregation deals like ebookers have acutely challenged the white high-quality and travel marketplaces so the digital networked economy is a position which is connectivity has no limitation. Michael Century also mention about Bauhaus Exhibition with some picture which was very interesting, so I research about Bauhaus. The “The building of the future” was to unite all the arts in model agreement. This required a innovative category of artist further than educational specialization, for whom the Bauhaus would offer sufficient knowledge. In order to reach this objective, the creator, Walter Gropius, saw the need to develop new teaching methods and was persuaded that the bottom for any art was to be established in handcraft. Indeed, artists heading for groups and manufacture collectively at the Bauhaus in Weimar. This was planned to take away any distinction between fine arts and applied arts. The reality of technical civilisation, however, led to requirements that could not only be fulfilled by a revalorisation of handcraft. In 1923, the Bauhaus reacted with a changed program, which was to mark its future picture under the slogan: “art and technology - a new unity”. Industrial possible were to be applied to acceptable design standards, concerning both functional and visual sides. I also attended Cindy Keefer’s lecture, “Music for the Eyes: Visual Music Films”. The lecture was a series of films that were meant to connect sound, color, and form. She explained that the intention is to “see sound”. She introduced the artist and musician, Norman McLaren, as one of the pioneers in showing sound. His work was done in the 40s and had a huge impact on various other artists. This is an interesting video demonstrating his attempt at showing sound through these dots. This is just the beginning of amazing attempts at showcasing what sound looks like. Artists have even used images of the sun to display sound. This reminds me a lot of musical fountains that captivated me when I was a child (sometimes even now). The musical fountains find the perfect harmony between sounds, colors, and visual effects. They are just the next step from videos, the 3-dimensional form. I attended a few of the lectures from the Sound and Science Symposium, and one of the more interesting ones was the Illusions in Music and Speech presented by Diana Deutsch. She explores illusions that people perceive from particular types of sounds. There we a few interactive examples she gave to the audience, and some of them were really interesting. The first example that I thought was interesting a sound file that repeated the words “hi” and “low” over and over again in different ears. I was unable to find the audio file online but she claimed that each person will hear different things. When the sounds file was played, as she said, everyone heard different things, a lady next to said she heard “Think How” and Deutsch said that some people hear the phase “Die Now,” I was able to focus in on the “Hi Low,’ but I think it was because I was trying to. However, in all of her examples, it seems like she is trying to force the result. In this case, the phase was repeated at a very high rate, had it been slower everyone would have heard it. The next audio example that she played was a series of four two tone tests for the audience. Each person will think a different tone is louder. When the audience was polled, the majority picked one, but there were a people who heard differently. 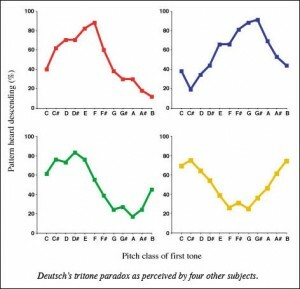 Deutsch conducted this test in different areas around the world and showed that different regions hear the tones differently amongst other regions, but there was a majority vote for each tone within the regions. The last example was the one that cause the most commotion. Deutsch is trying to explore phases that create illusions in the way people listen. After someone listens to this phrase, they begin to hear it as melody, even though the woman is saying it normally. I happen to hear it as a melody the first time it was played since she explained what was going to happen before we listened to it. Again, I think she was forcing an answer from this phrase because it was apparent that she was following the melody when she said the phrase out loud. In any case, she is very interested in exploring phrases that produce this illusion. So far, she has been unable to discover another phrase that produces the same result. Taking this into account, I believe this is just a coincidence of syllables that produces this affect. During the Q&A, someone asked if the audio spacing of each word was made uniform whether the same affect is produced, and she said no. It seems there are a lot of interesting unpredictable things that can come of sound, but I think if people try too hard, false result can be produced, or a normal result will be over thought into a meaningful result. Last week I attended the Sound Symposium and attended Douglas Kahn’s “Aesthetics of Natural Radio” lecture. I found the topic to be really bizarre because it was mainly about individuals listening to the sounds of technology. The Whistlers is described as the trajectory of trapped particles that creates a sound. The speaker informed us about Thomas Watson who listed to the sounds in the telephone well into the night to hear the static currents. I found this really curious because I have often been bothered by electric static from televisions and telephones that is so loud in the quiet of night. I always thought I was going a bit crazy, hearing static currents, but I am glad that people spend their lives listening to these electric sounds. Furthermore, Douglas incorporated nature into the electrical sounds, like snaps, crackles, pops, and squeaks. He explained that nature is part of the technological surface created by humans. 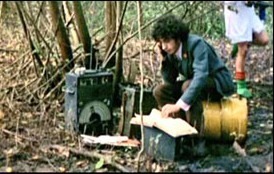 So he often goes into the forest to listen to the static that might be picked up in nature, as well as the sounds of nature. These sounds are what he describes as the natural radio, an interesting concept I had never really thought about. He also records these sounds as artistic collaboration of music. The main question I had was whether these sounds, various frequencies that are a result of the various man-made technology. It seems likely that these machine sounds would have some negative effects just like they are now saying that cell phones may cause brain cancer. However, none of the articles I researched claimed that there were any adverse effects of these frequencies.